Panayiotis Christodoulou holds a PhD in Computer Engineering and Informatics from the Cyprus University of Technology (CUT). He completed his undergraduate and postgraduate studies at the Manchester University, UK (MEng) and the Frederick University, Cyprus (MSc). He is currently a member of the Software Engineering and Intelligent Information Systems Research Lab (SEIIS) located at CUT. 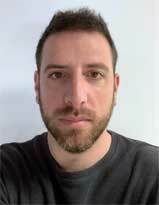 Panayiotis has a lot of experience in managing EU projects as he was a project manager in the INNOLABS project and he is currently a member in various EU funded projects (DOSSIER-Coud, SmartGov, ΕΠΙΡΡΟΗ). In addition, Panayiotis has a lot of teaching experience as he was a Lecturer at CDA College in Pafos and he is currently a Visiting Lecturer at Neapolis University in Pafos and a Teacher at Pafos Evening Schools.